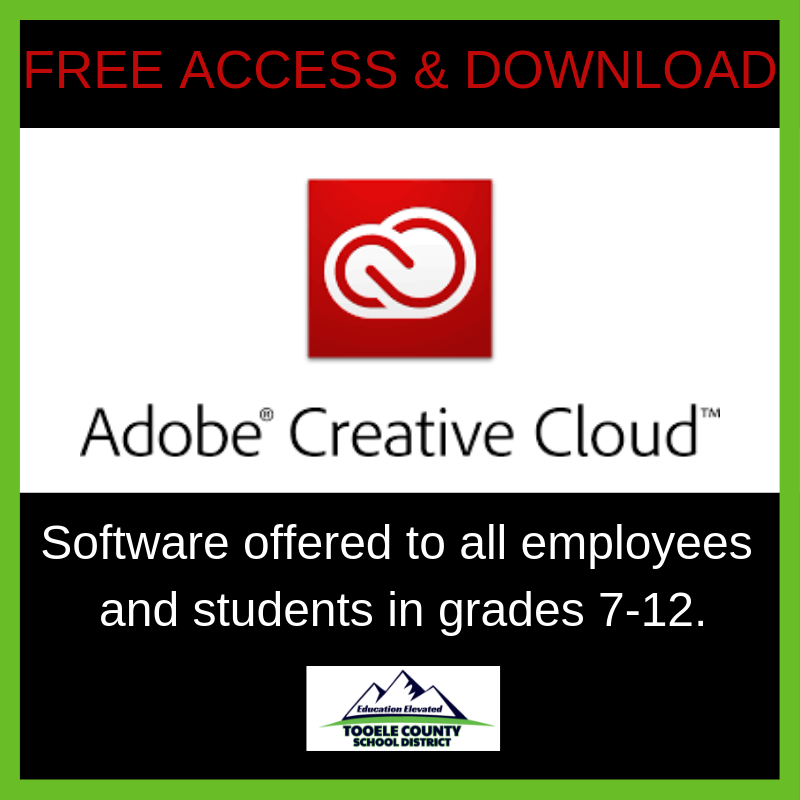 On March 11, email accounts ending in @tooeleschools.org were sent instructions on how to setup an Adobe password and create an Adobe Creative Cloud account. The account provides the ability to use Photoshop, InDesign, Lightroom, Illustrator, Spark and more. Projects can be accessed on a personal or school computer. Each user receives 15 gigabytes of cloud-based storage to help avoid using up storage capacity on a computer or mobile device. Students and employees are provided a one-time downloadable version of the software. The download allows use of the programs without an internet connection. However, the computer must have eight gigabytes of random access memory for the download to work. In addition to the apps, there are hundreds of hours of free-online tutorials through Creative Cloud Learn. Users can learn programs at their own pace. Grant Roberts, Graphic Arts teacher at the Community Learning Center, believes making this software available will allow students to move beyond the classroom to be able to work on projects they are passionate about. The process to arrange for Adobe accounts began more than a year ago when Superintendent Dr. Scott Rogers asked the Information Technology Director, Jim Langston, to become involved with the Adobe Utah Pilot Program. The program included Adobe representatives, the Utah Education Network and the Utah Board of Education. Negotiations on usage contracts began in June 2018 and were finalized in February 2019. Langston said the contract has multiple benefits. “It’s a cost-saving feature for employees and students. It provides the latest industry applications to students preparing for college attendance and gives staff access to innovative tools for staff and students to enhance their online communications,” said Langston. Being able to partner with Adobe provided a cost-saving benefit for the school district as well. The Adobe suite normally costs $600 per year, per person. According to Langston, the school district will only need to pay $5 per person, per year. Now junior high and high school students have free access to the Adobe software and tutorials, an advantage Roberts said will help them be digitally literate for the future. “Students who are fluent in using Adobe software will be miles ahead of their counterparts in future education and employment. Students who are familiar with these tools will easily be able to create professional looking presentations, website mockups, posters, fliers, and much more,” said Roberts. At the beginning of the school year, junior high and high school students were provided a district email and free access to Office 365. Along with the Adobe Create Suite, students have access to a downloadable version of Office 365. The download can be used on a personal device and does not require an internet connection. An Office 365 account gives users the ability to use programs such as Word, Excel, PowerPoint and Sway on any computer or hand-held device. Office 365 is a cloud based program that allows students access to their work wherever they go. Any files created can be saved to the online storage system, Microsoft OneDrive. If there are any issues, access to Adobe Enterprise support is being offered to provide exclusive contact with tier two and three Adobe support staff. This means faster assistance for technical difficulties. If you need assistance setting up a user account for Adobe or Office 365, please contact the school district IT Help Desk, Monday through Friday from 7 a.m. to 4 p.m. at 435-884-7799 or via email at helpdesk@tooeleschools.org .